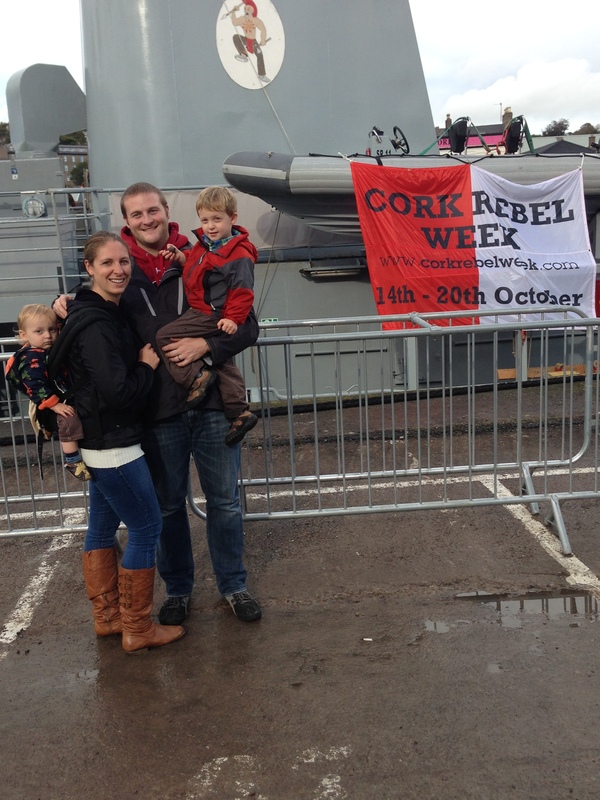 Cork is all abuzz this week because it is “Cork Rebel Week”. You see, back in the Irish War of Independence and the Irish Civil War the people of Cork–and the city itself–got quite a reputation for being, shall we say, enthusiastic fighters. They were rebels. They fought for this place. And still to this day, the people of Cork have such a sense of pride over their city that they often refer to it as a separate country (“The People’s Republic of Cork”) or as the “Real Capital” of Ireland. It is fitting, then, that there would be a whole week each year devoted to all that is wonderful and Rebel. There were several events happening all week–parades, concerts, even a bouncy ball race down the steepest hill in the city (for David’s sake I’m actually pretty disappointed that we missed that one. There’s always next year). 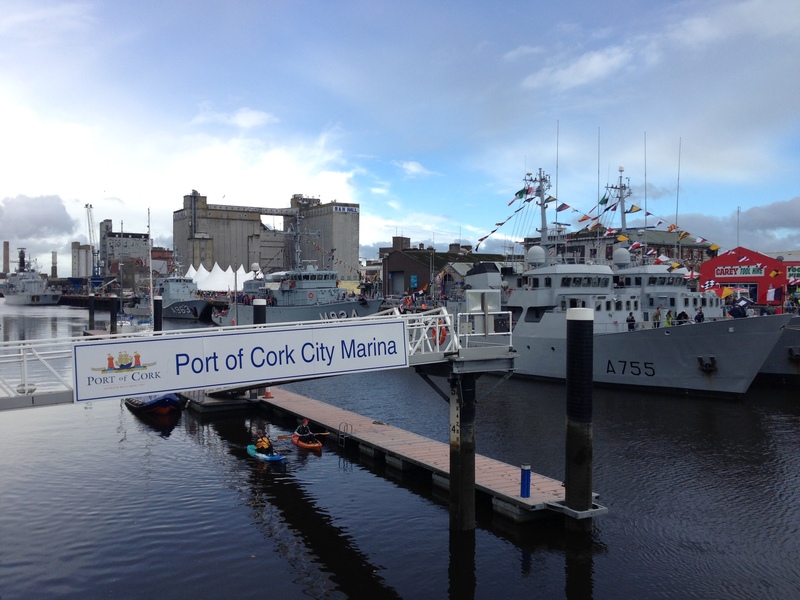 Today was the last day of Rebel Week and we managed to make it to one last festivity: The International Naval Festival. And, in all honesty, it would have been pretty hard for us to miss it. The ships were literally stationed in the water right across the street from our church. So, after church we walked across the street to check out all the action. We grabbed some Thai food from a food truck and then explored the marina. On display were ships from Ireland, Russia, France, Amsterdam and Germany. This is an Irish vessel. We asked a sailor who was stationed in front of this ship if he could tell us a bit about it. He started: “It’s really old…it was built in the 80’s.” Well, I guess that makes me ancient by Irish naval standards. All of the ships were open to the public to walk on board and have a look around. David only tried to jump overboard 3 times. 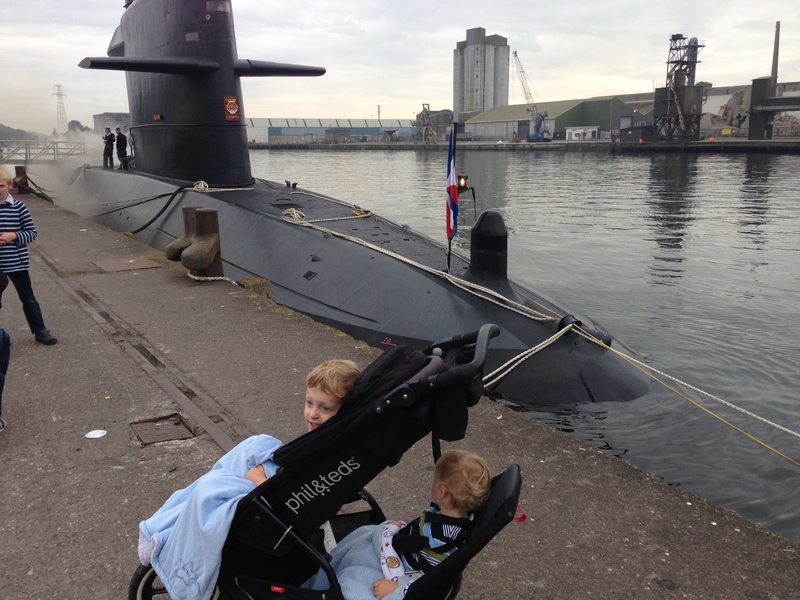 And, even though this was last Sunday, I thought I’d include one last Big Ship that we saw this week: a Dutch Submarine. 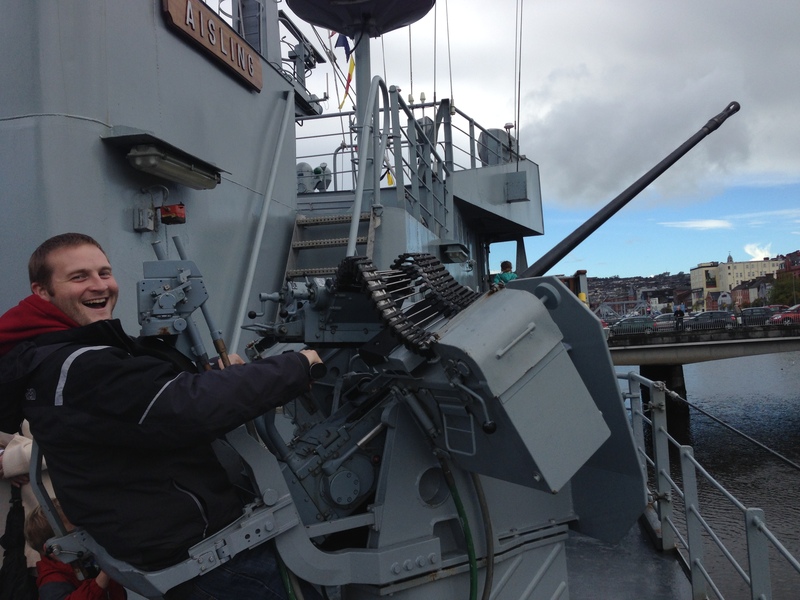 It was massive and loud and I’ve decided I would be terrified to ride in a submarine. It was incredible to see it up close, though! This week we are getting our first visitors from home: my parents! I am so super-duper-incredibly-excited to see them and show them around Ireland, so expect a few blog posts soon with some of our adventures! David’s most recent obsession is this book called Alexander And The Terrible, Horrible, No Good, Very Bad Day. It’s about this poor boy, Alexander, who is just having the worst day ever. I enjoyed reading this book as a child and now my son is obsessed, too–I guess that misery really does love company. Last night I only got 4 hours of sleep last night because Jacob is teething and David had a nightmare about the shadows on his ceiling and just as I was finally starting to drift off to sleep our dog barked at the neighbor’s cat. This morning as I was walking down the stairs to make breakfast I tripped on a rogue Lego and now my foot has a tiny brick-shaped bruise on the bottom of it. I can already tell that it is going to be a terrible, horrible, no good, very-bad day. When I started to make breakfast there was no milk left in the jug. Who drinks all of the milk and puts the empty container back in the fridge? Oh well, I didn’t have time to eat anyway. I had to get both kids dressed, fed, cleaned up, lunches packed and off to school before it was time to drive Daddy to work. I decided that I should get dressed, too, but none of my clothes looked cute this morning. I just put on yoga pants and a dirty t-shirt and called it good. I think I need to live in a place where it’s acceptable to wear grungy clothes and flip flops every day. I think I’ll move to Hawaii. After I got everyone else where they needed to be, I had exactly 2 hours before I needed to be back at the preschool to pick David up. I ran (literally, ran. This is the only exercise I got today) to the grocery store to get more milk. Then I ran back home do a few loads of laundry, iron Jon’s work shirts, vacuum the carpets, sweep the floors, feed Jacob a snack, put away the breakfast dishes, clean the bathrooms, take out the garbage and mow the lawn. In the rain. Ugh. I think I need to move to Hawaii. When I picked up David from preschool I noticed that he was wearing the “pants of shame”: he’d had a potty accident at school. David was the last pupil dismissed because the teacher wanted to talk to me about The Accident. Apparently it was pretty bad and they had to cut his pants off of him. Great, I actually liked those pants. It’s definitely a terrible, horrible, no good, very bad day. On our walk home from preschool Jacob was screaming because he was hungry for lunch and David was whining because I wouldn’t let him play Angry Birds on my iPhone and I stepped in a pile of dog poop on the sidewalk and I walked right through a fresh spider web and got the nasty web strands stuck all over my face. It’s been a terrible, horrible, no good, very bad day. I knew that it was a terrible, horrible, no good, very bad day because after lunch I tried to do an art project with the boys but David colored all over the kitchen table and Jacob ate all of the crayons. David put glue in his hair and Jacob smeared paint all over his body like he was some sort of native warrior. After the art fiasco I tried to give them a bath but we didn’t have any hot water so I had to heat kettles of water in the kitchen (downstairs) to fill the bathtub (upstairs) and then when I finally got the tub full and warm enough for their fragile little bodies David decided to pull the drain-stopper and all of the water vanished before I could stop it. When I move to Hawaii at least the ocean is warm and I can just give my kids a bath at the beach. During nap time Jacob bit his tongue trying to jump out of his crib and David snuck out of his bedroom and emptied the contents of the bathroom garbage can all over my bed. Neither child slept so now they are both exhausted and cranky. This is a terrible, horrible, no good, very bad day. I got a calendar reminder to file our taxes next week. Next week, I said, I’m moving to Hawaii. While I was trying to make dinner David threw a temper tantrum because his orange ball had dirt on it and the dog looked at him funny. Jacob slammed his fingers in a drawer and he wouldn’t stop howling like a wounded wolf pup unless I held him. I burned the chicken and the pasta pot boiled over and I overcooked the broccoli so it got all soggy. I hate soggy broccoli. David spilled a full jug of milk all over the kitchen floor (the same jug of milk, mind you, that I already had to replace this morning) and Jacob threw his entire plate of dinner on top of the dog. I had to microwave my dinner 3 times before I ever got one single bite in. It has been a terrible, horrible, no good very bad day. At bedtime David refused to put on his pajamas, he bit my finger when I was helping him brush his teeth, and it took over an hour to convince him to stay in his bed after lights-out. When we finally got both boys in their bedrooms I went downstairs to try and relax for an hour before my bedtime but there were no good shows to watch on Hulu and the book that I’m reading has somehow disappeared. I couldn’t find my cozy slippers and the dog didn’t want to snuggle with me. I told Jon I’ve had a terrible, horrible, no good, very bad day. He said some days are like that. *Disclaimer* Although all of the events in this story have actually happened to me, they have never all happened simultaneously in one single day. This is God’s grace to mothers! I love my children and I would take all the bad days in the world if it meas that I got to keep loving on my boys each and every day, through the good AND the bad. That being said, I still wouldn’t mind a trip to Hawaii. Without the children. David loves “projects” so I’m always looking for fun, simple activities we can do together. I recently came across this idea for a preschool science experiment involving milk and food coloring. Sold! 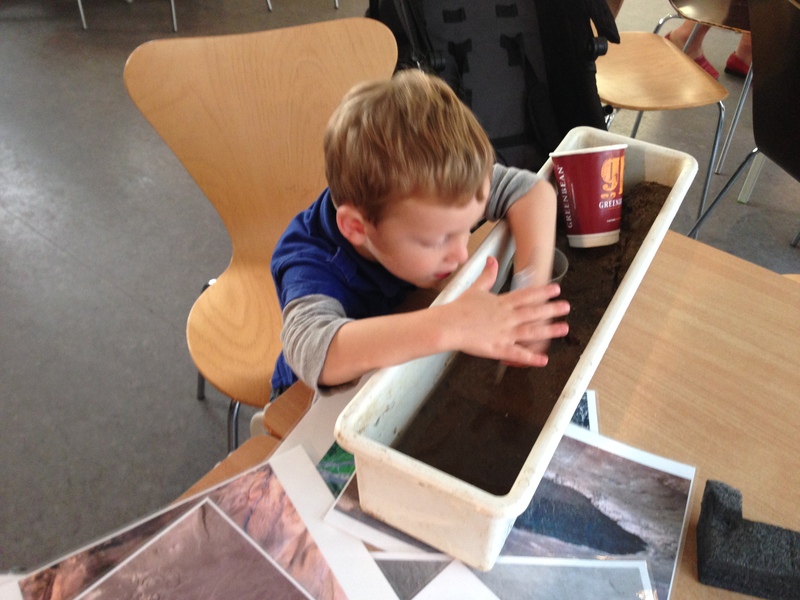 Once you’ve gathered your materials, the fun begins! Start by pouring milk into the pan until it just covers the bottom of the dish. Drop 4 or 5 drops of each color of food coloring near the center of the pan so the colors are close together. Tell your preschooler to resist the beautiful colors and keep his hands to himself for 2 more seconds. Dip the end of a Q-tip into the center of the colors and watch what happens (nothing, except maybe you push a bit of milk around). Now ask your child what you think will happen if you dip the same Q-tip into soap before dipping it into the center of the milk (“What is your prediction, child? Will anything be different? What do you think will happen?”). Now, generously coat the end of the Q-tip or toothpick with dish soap. Dip the Q-tip into the center of the colors and hold the Q-tip still (I know, holding still is a difficult concept for a preschooler, but trust me–it’s worth it!). Now watch the colors explode as they dance away from the Q-tip! Now dip the other end of your Q-tip in the dish soap and poke it down somewhere else in the dish. It’s like magical little fireworks repelling away from the Q-tip! I was curious about the science behind the color swirls so I did a quick internet search and found this great website with a thorough explanation. Turns out that dish soap is bipolar–not in the manic-depressive sense, but in the hydrophilic polar (water-loving) and hydrophobic non-polar (water-fearing) sense. When the water-fearing part of the dish soap connects with the fat in the milk, the magic happens. As all of the little soap molecules start racing around trying to find the milk-fat molecules to connect with they push the food coloring out of the way, creating those wonderful swirls. We thought that the colors were so pretty that we decided to try capturing them on paper. I just cut a few pieces of artist paper down to a size that would easily fit in our pan and we laid each piece straight on top of the color swirls before gently lifting it back up. The color swirl paper looks really beautiful (and, just in case you’re wondering, a few days later they still smell fine!). After playing with four batches of milk in the pan, it was time for another experiment. I came up with this one all on my own. What will happen if we replace the milk with water, take away the food coloring, add a bit of dish soap and switch out the Q-tips for scrub brushes? David couldn’t wait to find out! Ta-da! Prest-o, clean-o! Now that’s one science experiment that can keep all of us happy. I’ve had more than my share of “life changes” over the last few years. In less than a decade I have: graduated from college, gotten married, bought a house, raised a puppy (which is a lot more work than I ever gave it credit for! ), started a career, ended a career, supported my husband through graduate school, birthed two babies, and moved six times to three unique corners of the globe. With so many changes, it seems at times that the only constant in my life is change itself. 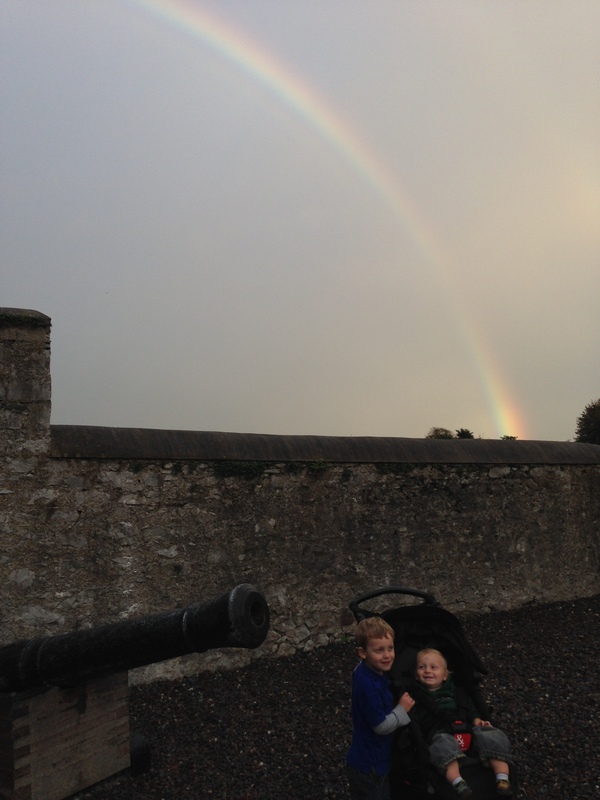 Moving to Ireland has no doubt been one of the biggest adjustments I’ve ever had to make. Living in a place that I’d never been to before, with people I’d never met, in a culture that is wonderful but different in so many ways has taken some getting used to. It’s taken some time. And that’s where the 3-month rule comes in. In my varied experience playing the “change game”, I have discovered that it takes exactly 3 months for the pieces to come together after Big Change. The first week is always chaos, the first month is exciting yet draining, the second month is a mix of “what did I get myself into?” and discovery, and by the third month you start to figure things out. At the three month mark you finally feel comfortable in the new scenario, like you can actually handle this New Thing. And that’s where I find myself now. 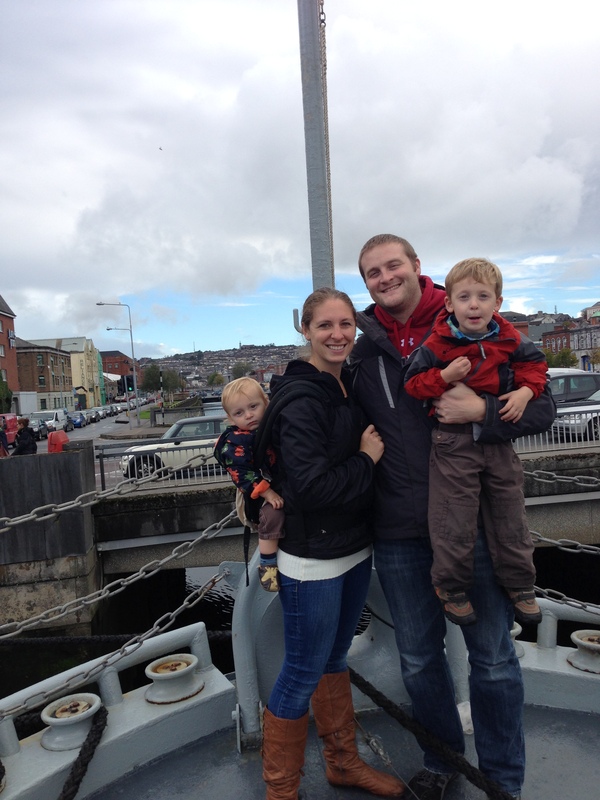 Today marks 3 months since we arrived in Ireland. I finally feel at home, like I fit in here. I know how to drive places without GPS (and I don’t even have to think twice about which side of the road to drive on any more!). 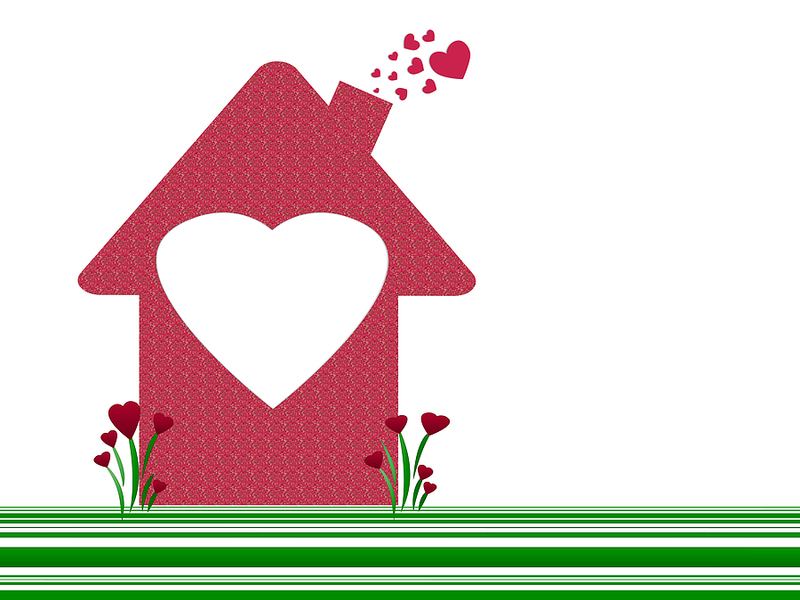 Our house feels like the place where our family lives. I remember to turn on the hot water boiler exactly 42 minutes before my kids need to take a bath. My son goes to school. I know where to find everything at the grocery store and I know my favorite vendors by name at our farmer’s market. I have a favorite park. I am serving at our church. I know our neighbors. I have friends. I am at peace with my Big Change. But that still doesn’t mean that it’s always easy. There are times where I miss my friends and my family and I just want to talk to them and I go to call them and then realize that it’s 3 AM in Seattle so I hang up the phone. Or when I crave something from home that I just can’t have (where are the pumpkins, Ireland?!). Or when I start a conversation and realize that nothing I’ve said actually makes sense to the person I’m talking to. So, yes, there will still be adjustments and some things that I just have to get over. But that’s all part of the beauty of living through a Big Change: it changes you. And that really is the best part of this whole experience: I know that I will walk away from this a different person, a better person. My life is being enriched by the people I am meeting, the places I am seeing, the new ways I am learning to think and to live. I am learning to trust God in new ways and to call on Him (no crazy time zones to worry about there!). Nobody ever said that change was easy, but I think that it is necessary. And now, after 3 months, I can honestly say that I appreciate this change. Here’s to 3 months down, and many more to come. The learning curve is over–let the fun begin! One of the first things that struck me when we moved to Ireland was the number of castles. You’ll just be driving or walking along here, turn a corner, and–BAM!–castle! They’re everywhere. Some are just little piles of rubble and others have been beautifully restored. Coming from Seattle where the oldest thing we have is a crumbling piece of highway called The Viaduct, the castles have made quite an impression on me. 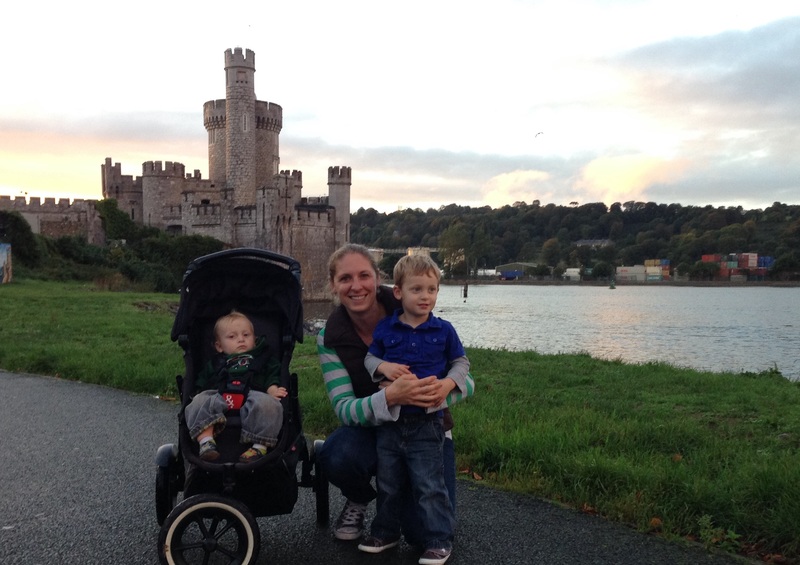 There’s a really neat castle down the road from Jon’s office called Blackrock Castle. This particular castle was recently restored and is now home to a restaurant and an observatory/science center. It’s right on a pedestrian path that goes along the waterfront, so I frequent the area on my runs. Until this week, though, I had never set foot inside the castle walls. Friday happened to be “Free First Friday” at the castle and, since “free” and “castle” happen to be two of my favorite words, I just had to go. All of the exhibits were open to the public for free in the evening, and they even had some little workshops and a guest speaker available (we didn’t burden the guest speaker with our presence). 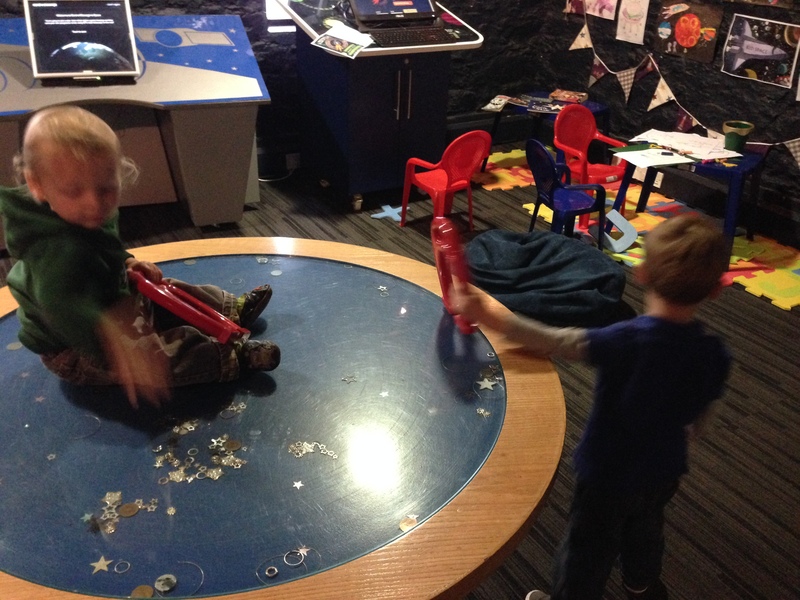 We did have a great time exploring the hands-on exhibits inside the observatory. 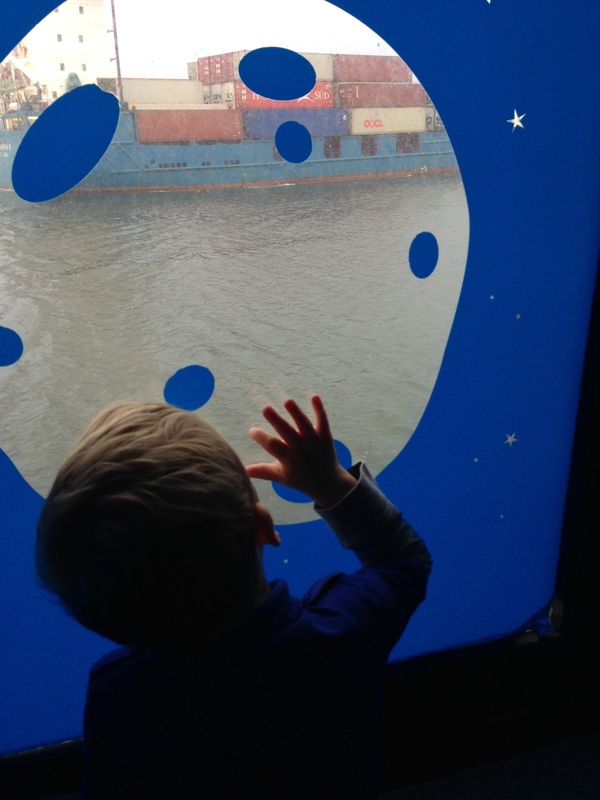 We looked out a “moon window” at a cargo ship floating past us in the harbor (I pointed out that this was the same kind of “big ship” that carries little boys’ balls and toys from places like Seattle to places like Ireland). Goodnight, castle. Goodnight, rainbow. Goodnight, Ireland. 1. Leaves are gathering on the ground. 2. I’m craving all things pumpkin. 3. We have rainy days. Lots and lots of rainy days. Number 3 is the one I least look forward to. After the long, warm days of summer it’s a bit of a rude slap in the face to suddenly be forced back indoors against my will. But, since I can’t get rid of the rain (and probably won’t for the next 10 months or so…) I will choose to make the best of our long days indoors. I happened to have an empty plastic egg carton in my recycling bin and it seemed like the perfect receptacle for David’s paints (I didn’t want to give him all of the full cups of paint because I actually wanted to preserve some of those beautiful colors for future use. Something I’ve learned about paint and little boys: it only takes them about 3 seconds to smoosh a rainbow of colors together into one giant brown blob). The egg carton worked brilliantly. For Jacob, I just scooped little bits of paint directly onto his paper. It took him less than 2 seconds to get that first bit of paint in his mouth (yay for edible paint!). I also found that it worked better to tape his paper down with a bit of painter’s tape so he wouldn’t keep trying to eat his paper. Both boys had a fine time painting and the paints actually worked really well. The color was rich and vibrant and the consistency was very smooth. Jacob lasted for about 5 minutes with his art project (not bad for a 1-year old) and I had to cut David off after a few pictures so I could complete the last, essential step of this project: a bath. See, rainy days aren’t so bad after all.